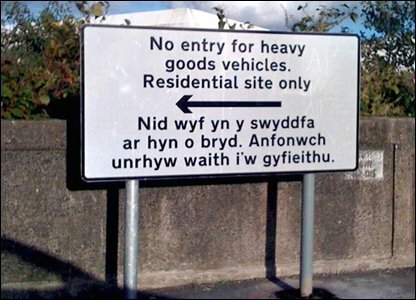 This entry was posted in english, OverHeard, rant and tagged fun, road-sign, welsh by .marius. Bookmark the permalink. I don’t speak Welsh, but then again, this is not the first time I see a bilingual sign either. Any other brave translators around? from what I`ve seen in bbc news, there are a lot of miss-translated signs. One of those was in English: Look right and in Welsh Look left! I`ve laughed my pants off when I`ve read the news on bbc about this kind of signs … thanks Perry!